Deal 1 damage to a creature. If it survives, draw a card. Rapid Shot is a common Strength action card. It is part of the Core Set. In addition to the card's availability in the Core Set, three copies are included in the Aela's Companions theme deck, and three copies in the Paarthurnax's Roar theme deck. 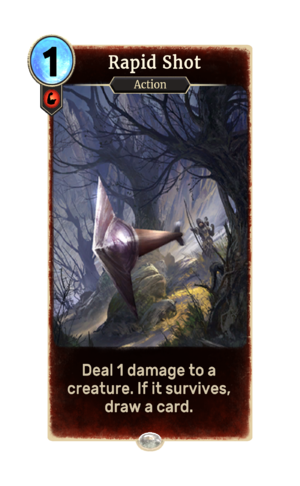 One copy is also obtainable in the Band of Survivors deck as a reward from A Knife in the Dark. Playing the card counts towards the Arrows Fired statistic.